These Hunger Games cupcakes from Fictional Food are a tribute to the trilogy, soon to be movies. Yellow cake batter is separated into two bowls and colored red and orange to resemble the flames in the story. The cupcakes are coated in fondant and decorated with an edible bird pin, one from each of the books. 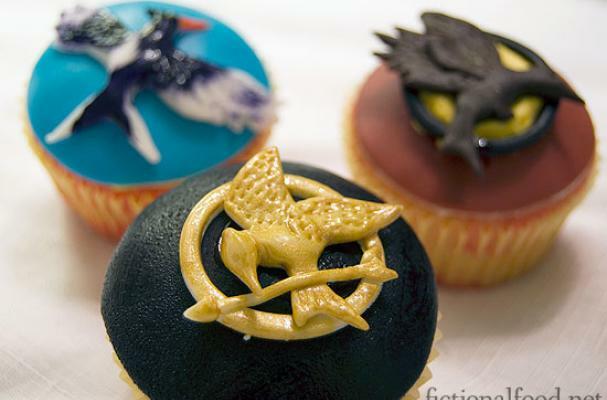 To recreate these Hunger Games cupcakes at home, you will require fondant, edible gold glaze, and color gels. The website features a video that gives detailed instructions on how to make the Mockingjay cupcake (the black and gold cupcake) which can also be applied to the other two designs. Hunger Games cupcakes are sure to impress any Suzanne Collins fan.